These highlights do not include all the information needed to use POTASSIUM CHLORIDE safely and effectively. 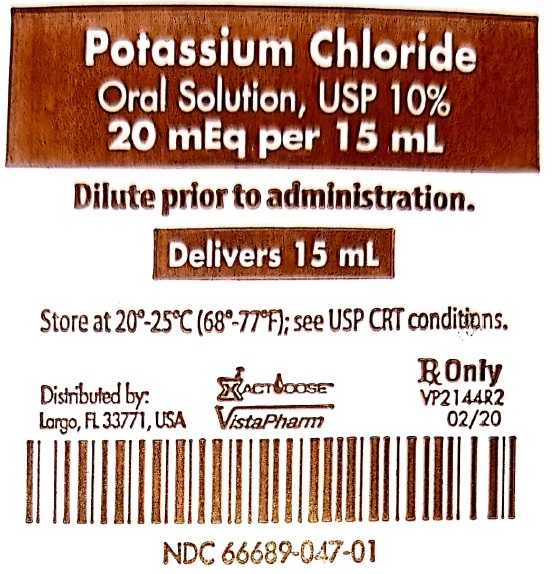 See full prescribing information for POTASSIUM CHLORIDE. To report SUSPECTED ADVERSE REACTIONS, contact 727-530-1633 or FDA at 1-800-FDA-1088 or www.fda.gov/medwatch. 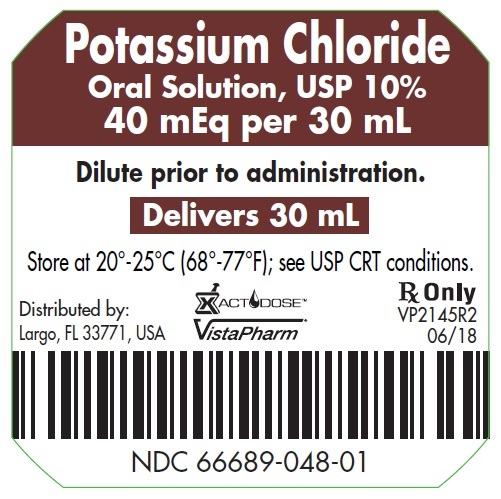 Potassium Chloride is indicated for the treatment and prophylaxis of hypokalemia in patients for whom dietary management with potassium-rich foods or diuretic dose reduction are insufficient. Oral Solution 10%: 1.3 mEq potassium per mL. May cause gastrointestinal irritation if administered undiluted. Increased dilution of the solution and taking with meals may reduce gastrointestinal irritation [see Dosage and Administration (2.1)]. The safety and effectiveness of potassium chloride have been demonstrated in children with diarrhea and malnutrition from birth to18 years. Hyperkalemia is usually asymptomatic and may be manifested only by an increased serum potassium concentration (6.5–8.0 mEq/L) and characteristic electrocardiographic changes (peaking of T-waves, loss of P-waves, depression of S-T segment, and prolongation of the QT-interval). Late manifestations include muscle paralysis and cardiovascular collapse from cardiac arrest (9–12 mEq/L). 1. Monitor closely for arrhythmias and electrolyte changes. 2. Eliminate foods and medications containing potassium and of any agents with potassium-sparing properties such as potassium-sparing diuretics, ARBS, ACE inhibitors, NSAIDS, certain nutritional supplements and many others. 3. Administer intravenous calcium gluconate if the patient is at no risk or low risk of developing digitalis toxicity. 4. Administer intravenously 300 to 500 mL/hr of 10% dextrose solution containing 10 to 20 units of crystalline insulin per 1000 mL. 5. Correct acidosis, if present, with intravenous sodium bicarbonate. 6. Use exchange resins, hemodialysis, or peritoneal dialysis. Potassium Chloride is a white crystalline or colorless solid. It is soluble in water and slightly soluble in alcohol. Chemically, Potassium Chloride is K-Cl with a molecular mass of 74.55. Oral Solution: 10%: Each 15 mL of solution contains 1.5 g of potassium chloride, USP and the following inactive ingredients: citric acid anhydrous, FD&C Yellow #6, glycerin, methylparaben, natural/artificial orange flavor, propylene glycol, propylparaben, purified water, sodium citrate dihydrate, sucralose. (NDC# 66689-047-01), packaged in trays of 10 unit dose cups each. (NDC# 66689-048-01), packaged in trays of 10 unit dose cups each. Store at Controlled Room Temperature, 25°C (77°F); excursions are permitted to 15° - 30°C (59° - 86°F). Dispense in a tight, light-resistant container as defined in the USP PROTECT from LIGHT.